Materials: None needed, optional video recorder. See ‘Interpretation’ for scoring rubric. Both a neuromuscular training program (decreased from 5.4 ± 1.6 points to 4.9 ± 1.0 points) and a standard soccer in-season training program (decreased from 5.8 ± 1.6 to 5.0 ± 1.5 points) were able to significantly improve Tuck Jump Assessment scores (Klugman et al, 2011). Additionally, following augmented feedback training, deficits measured during the tuck-jump assessment were reduced by 23.6% in young female athletes (Stroube et al, 2013). This finding agrees with the randomized controlled trial conducted by Myer et al, which found a reduced Frontal Plane Knee Angle following augmented feedback training of 37.9% over 3 trials. 1. Myer GD, Ford KR, Hewett TE. 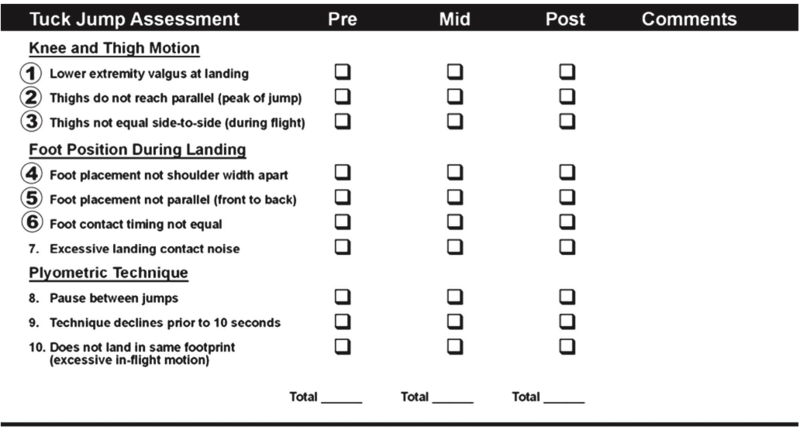 Tuck jump assessment for reducing anterior cruciate ligament injury risk. Athletic Therapy Today. 2008; 13(5): 39–44. 2. Klugman MF, Brent JL, Myer GD, Ford KR, Hewett TE. Does an in-season only neuromuscular training protocol reduce deficits quantified by the tuck jump assessment? Clinics in Sports Medicine. 2011; 30(4): 825–840. 3. Myer GD, Brent JL, Ford KR, Hewett TE. Real-time assessment and neuromuscular training feedback techniques to prevent anterior cruciate ligament injury in female athletes. Strength and Conditioning Journal. 2011; 33(3): 21–35. 4. Dudley LA, Smith CA, Olson BK, Chimera NJ, Schmitz B, Warren M. Interrater and Intrarater Reliability of the Tuck Jump Assessment by Health Professionals of Varied Educational Backgrounds. Journal of Sports Medicine. 2013; 2013: 1-5. 5. Herrington L, Myer GD, Munro A. Intra and inter-tester reliability of the tuck jump assessment. Physical Therapy in Sport. 2013;14(3):152–155. 6. Myer GD, et al. Augmented Feedback Supports Skill Transfer and Reduces High-Risk Injury Landing Mechanics: A Double-Blind, Randomized Controlled Laboratory Study. American Journal of Sports Medicine. 2013; 41(3): 669-77. 7. Stroube BE, et al. Effects of task-specific augmented feedback on deficit modification during performance of the tuck-jump exercise. Journal of Sport Rehabilitation. 2013; 22(1): 7-18.